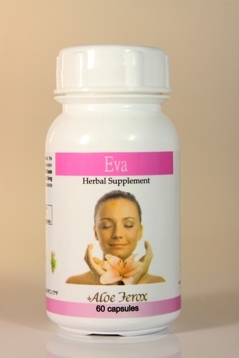 Aloe Ferox Eva is a natural herbal supplement for women to help improve sexual wellbeing. It is particularly helpful with hormonal balance during that ‘time of the month’ (menstruation), adolescence and at midlife, during menopause. 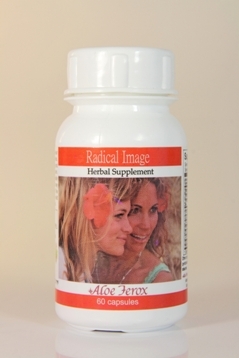 This is a natural herbal supplement for women to help improve wellbeing. It is particularly helpful with hormonal balance during that ‘time of the month’ (menstruation), adolescence and at midlife, during menopause. Why use Aloe Ferox Eva every day? Take 2 capsules daily with meals. Active ingredients. 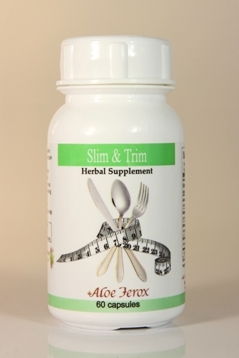 Aloe ferox Whole-leaf, Damiana, Angus Castus, Black Cohosh, Pyridoxine HCI. Supplement facts. Amount per tablet. Aloe ferox whole leaf 150 mg (as aloe ferox dried leaf powder), Damiana 50 mg, Agnus castus 150 mg, Black Cohosh (8:1) 40 mg, Pyridoxine HCI (Vit B6) 5 mg (% RDA 250%. For a general ‘pick-me up tonic’, team with Aloe Ferox Whole-leaf Aloe Juice is packed with natural goodness and medicinal compounds (over 130 in fact) to help improve vitality and maintain vigour. If skin is prone to spots, pimples or acne, Radical Image is a natural herbal supplement which will help to repair skin from within. For best results with herbal products, you should use for at least three months consecutively. For the man in your life, Adam from Aloe Ferox offers a herbal remedy to male prostate problems and erectile dysfunction.